Party Games Slotto is a “good ol fashion” slot machine. Enjoy up to 20 paylines over the 5 reels and hit 3, 4 or 5 of the Sheriff symbols and you will unlock the “Pick a Prize” feature. You will pick one of three symbols and get generously awarded. With a good number of Wild symbols and 7’s you can easily make a high win by playing the Party Games Slotto from Astra Games. 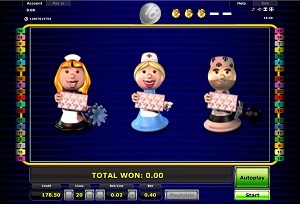 Graphics & Appearance: Party Games Slotto is a modern version of the old classic slot machine. Over the five reels and the twenty paylines you will come across several cherries, melons, 7’s and plumbs to the sound of pops (spin wins) and other sounds that are common on the classic slots. Party Games Slotto is pretty basic and it has a relaxing feel to it. You will not find any features with mega graphics and sound effects that will disturb your neighborhood. This slot is designed for the true slot enthusiasts. Gamble Feature: There is no Gamble feature on Party Games Slotto. Game Symbols: Party Games Slotto offers all the classic symbols. The highest paying symbol is the 7’s. You will also see the BAR, cherries, plumbs and melons. Apart from the fruity symbols, you will also see 10, Jack, Queen and King. The Wild symbol substitutes for any other and the Sheriff symbol unlocks the bonus feature once 3, 4 or 5 of them have been hit on the reels. Bonus Feature: If you hit 3, 4 or 5 Sheriff’s symbols you will unlock the bonus feature which is a “Pick a Prize” feature where you will choose one of three bonus figures by clicking on them. Your prize will then be revealed and added to your game balance. Betting Options: On this 5 reel you can bet on 20 paylines. To set your stake preference you just need to use the + and – button which are located in the bottom of the game window. 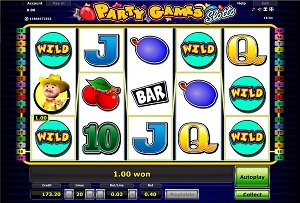 Game Features: Party Games Slotto offer you to use the Autoplay function. This is a very comfortable feature to use since you will not have to click on the Start button for every spin on the reels. You will Start and Stop the Autoplay function by clicking on the button called Autoplay. This button is located in the bottom right corner of the game window.